On the outskirts of Flushing, away from the commotion and underground food malls that line Main St, you’ll notice an elaborate Hindu temple protruding between unassuming houses and apartments. It’s formally known as Ganesh Temple Canteen, but almost everyone calls it Temple Canteen. Once inside, you'll be directed by signs that tell you two very specific things: 1) Do not break any coconuts (there are no coconuts here), and 2) Follow the arrows downstairs. That’s where you’ll find a large, '70s-looking cafeteria that's outfitted with folding chairs and banquet tables. 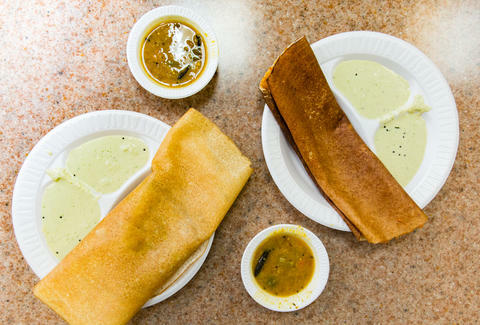 Besides being a place of worship, Temple Canteen is known for having the best dosas in New York. If you've never had a dosa before, here's the abbreviated version: it's a buttery and crispy South Indian pancake made from fermented rice and beans that’s sometimes stuffed, and often served with a side of chutney and sambar (a lentil-based stew/dip). At Temple Canteen, the most popular (and most classic) one is the Masala Dosa, which comes filled with potato, onion masala, and various spices for just $4.50. A single dosa measures almost 2ft and could easily feed two people. The best way to eat it is with your hands, which allows for optimal dipping into the sambar. There are a number of reasons the clientele here is a mix of locals and people who have ventured out to Flushing just for a pancake -- you don’t even have to drop $5 to get full, the volunteers who run the counter are crazy-knowledgeable and enthusiastic, and, most importantly, you can get a real taste of India, 8,000 miles away in Queens. Alex Robinson is a Cities Editor at Thrillist. Follow his adventures to mountains and basements on Instagram.